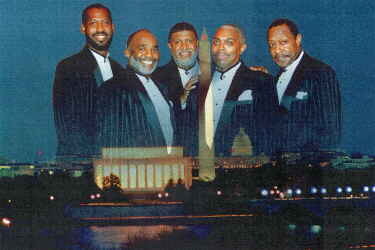 DC's Finest is an a cappella group from Washington DC. The group consists of active and retired DC police officers who are often referred to as "Doo Wop Cops." The group has performed at such places as the Kennedy Center, Constitution Hall, the Warner Theater, the National Theater, the Apollo Theater in New York City, RFK Stadium, the Mall of America in Minnesota, the Mayo Clinic, the University of Cincinnati in Ohio, Mayoral and Congressional affairs, and many local clubs, high schools and hospitals. Their unique style of singing has caused them to soar to heights that are usually only enjoyed by recording stars. They have jammed with Stevie Wonder, and have opened shows for Chuck Berry, Etta James, the Persuasions, the Dells, and many others. Experienced performers, they have entertained Heads of State and U.S. Presidents. Members of the White House staff asked DC's Finest to sing at the dedication of The Buffalo Soldier Monument in Fort Levenworth, Kansas on July 28, 1992. The group responded with a soul-stirring rendition of "Buffalo Soldiers", that won them praise from the Pentagon and a personal invitation to perform for General Colin Powell, a former Chairman of the Joint Chiefs of Staff. Each year DC's Finest spends a substantial part of their time performing benefits for schools, hospitals, and other charities. They also devote much of their time to singing for school children and counciling them on some of the complexities and realities of inner-city life. The group consists of Ron Jones, Avon Barbour, Joe Herndon, Richard Collins, Deane Larkins, and Reamer Shedrick - all retired. All members are Washingtonians who attended local high schools and sang at some point in their lives with a doo wop group in the 50's and 60's, which is how their authentic sound was developed. Those years are revisited by many each time the group takes the stage with their a cappella nostalgic renditions of songs of the past as well as some of the current hits. DC's Finest are extraordinary Doo Wop artists. They are regarded by many as one of the best a cappella groups in the nation. DC's Finest remain loyal to their community performing at benefit concerts at public schools and by serving as positive male role models for youngsters who are troubled with drug use, delinquency and abuse. DC's Finest can best be described as soldiers in their own army attempting to bring about harmony on and off the stage.